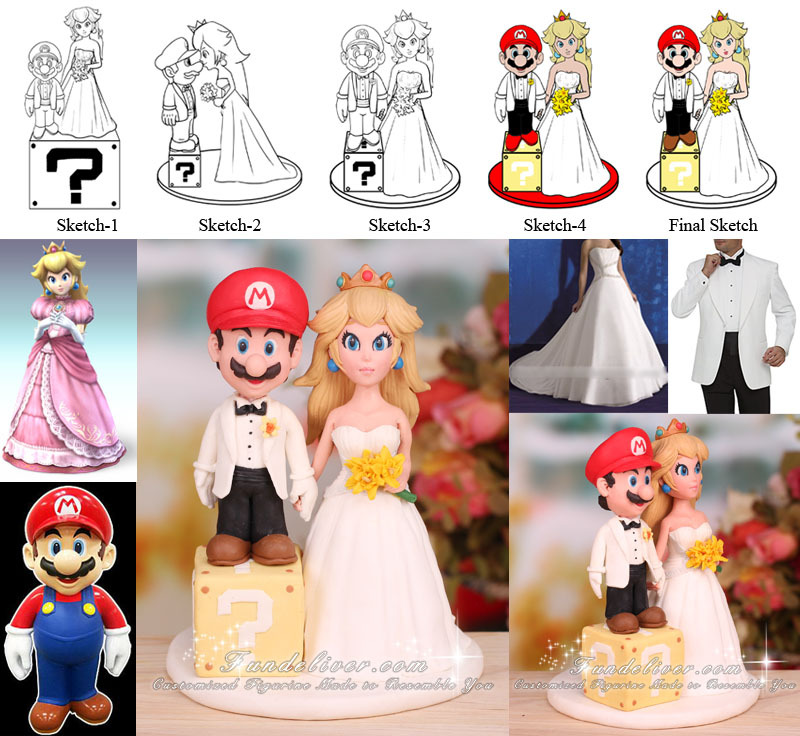 This is a completely customized Mario and Princess Peach wedding cake topper ordered by one of our customers. They would like Mario to be wearing a tuxedo (white shawl lapel jacket, black bow tie and cummerbund, and black pants) and Princess Peach to be wearing a white wedding dress and a golden crown on her head. Mario is shorter than Princess Peach, and standing on a question mark box to make him closer to Princess Peach's height. His feet fit within the bounds of the box, with no room to "walk around." The pose is the most interesting part. In their original plan they would like Princess Peach and Mario to be facing each other and Princess Peach to be leaning down slightly to kiss Mario's nose. However after checking the first 2D sketch, they changed their mind to classical pose (holding hands, standing side by side and facing forward). 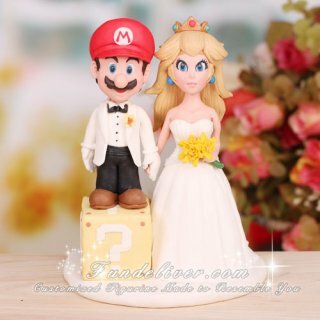 This Super Mario wedding cake topper is inspired by "Original character Nintendo / Game trademarks and Copyrights are property of their owners/ Nintendo, Super Mario Characters". However we can customize them to match your wedding theme and personality better. Just send us some reference images and your idea, we will first draw some sketches to get your approval and then turn it into 3D figurine. Make your imagination go wild to get your own Super Mario cake toppers!